BIG NEWS! Shopbop’s Friends & Family Sale started this morning and they’re offering 25% off everything sitewide! What’s in my shopping cart? Basically all of Tibi’s new arrivals (specifically this top), this gauzy coverup (hello, pink tassels! ), a new pair of white denim, and this multi-functional ivory infantry jacket by Current/Elliot. Oh, and these turquoise-adorned sandals. Gorgeous! Just enter code INTHEFAMILY14 at checkout and save! Click here to shop all new arrivals. Dallas friends and readers, stop by The Shak at Stanley Korshak this Thursday between 4:30-6:30pm to hang out with me and designer Cynthia Rowley, and shop her gorgeous spring collection! Click here for event details – hope to see you all there! A few items under $100 I’ve been craving this week include this ruffle-hemmed Rachel Pally top, these adorable polka-dot sunnies, this double pearl ring, and this leopard-print chambray combo. Sometimes you just need a break from the splurges and need to focus on items more friendly on your wallet. I’ll be traveling a lot this summer so I need to save up! Have you voted in Vanity Fair’s International Best Dressed contest? Click here to check out my profile and looks – would love your support and votes! #10 and 13 are to die for. Fabulous edit! That skirt is insanely beautiful. My favorites are 8, 11, and 12! The Rebecca Taylor dress is haute! I have been swooning over that Tibi skirt ever since I laid eyes on it! And must have that Tory Burch swimming suit, so retro and fabulous! Great picks! Love the sunnies and the wedges! ok, devastated by the price of #5! it’s so gorgeous! I’m so digging 1 and 13!!! Love 10 and 11!! Great picks as always! I love these choices! 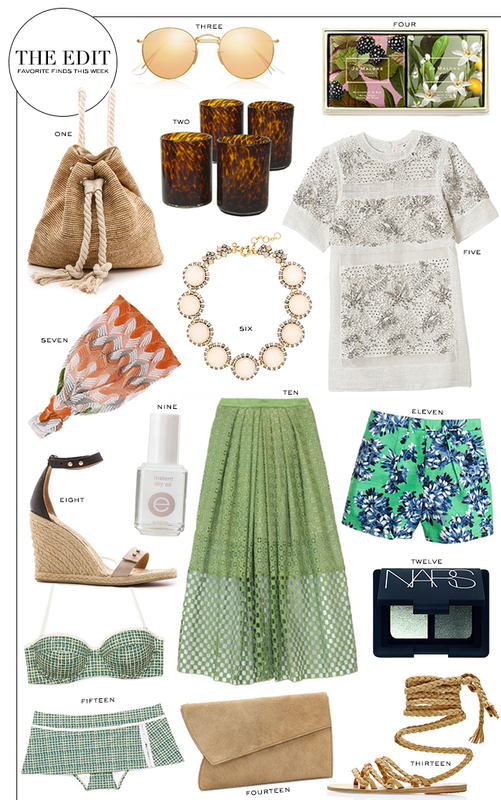 My favorites are definitely that tibi skirt and those rayban sunnies! Those shorts are so cute! And I kind of want to try that eye shadow! So fun! I will definitely try to make it by your event this week! Coveting the floral tap shorts. These would pair nicely with wedges and a crisp white blazer or a vintage tee, a denim jacket and sandals. So versatile! Great edit! I can’t live without my fast drying top for Essie! The shorts are fantastic too!